SB 2587, DOC V 544 Basilikon Obv: Christ seated facing, raising hand in benediction and holding Gospels. Rev: The Virgin Mary seated facing, holding baby Jesus; B B across fields. 1304-1320 (Constantinople). SB 2578, DOC V 1209, Bendall 362 Billon Tornese Obv: City walls with four towers; cross and pellets above, florets at sides. Rev: +О OО›ITIKON - Cross potent. c.1328-1354 (Constantinople). [Part of the so-called "Politikon" series; an autonomous issue of western merchants based in Constantinople]. $1,000 5/21/03. SB 1793 AE Follis (Class A) Obv: +EMMANOVHL - IC XC across field, facing bust of Christ, holding Gospels; two pellets in each limb of nimbus. Rev: +IhSUS/XRISTUS/bASILU/bASILE - Legend in four lines. 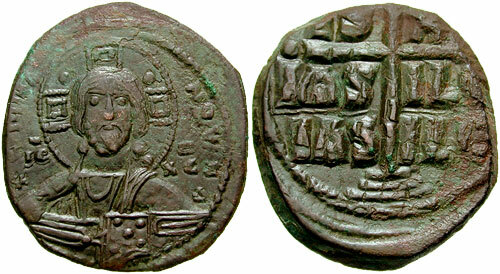 969-976 (Constantinopolis). 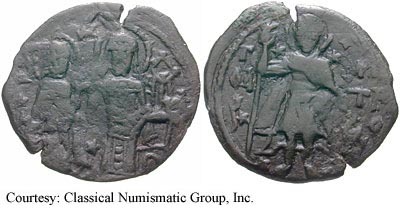 SB 1813 AE Follis (Class Obv: Facing bust of Jesus Christ, holding nimbus cross and gospel. Rev: +IhS S/XRIST S/bASIL /bASIL - Inscription in four lines. 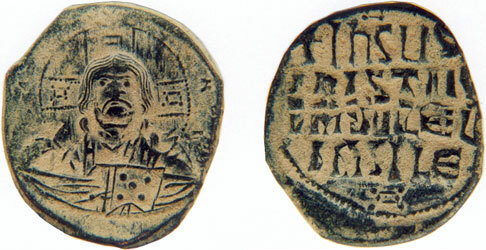 1003-1025 (Constantinople). 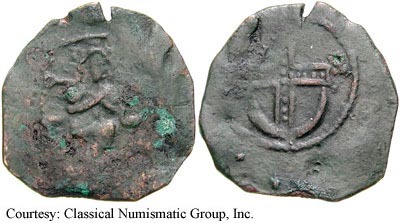 SB 1818 AE Follis (Class A3) Obv: Facing bust of nimbate Christ, pellets in the arms of nimbus, wearing pallium and colobium, holding the Gospels in both hands. Rev: +IhS S/XRIST S/bASIL /bASIL - Legend in four lines; arabesques above and below. c.1020-1030. SB 1823 AE Follis (Class Obv: +EMMANOVHL - Nimbate bust of Christ facing, holding book of Gospels; IC in left field, XC in right field. Rev: IS XS/bAS-ILE/bAS-ILE - Legend in three lines, cross, with pellet at each extremity, on three steps. 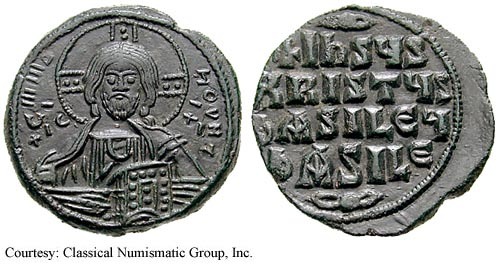 c.1028-1034 (Constantinople). 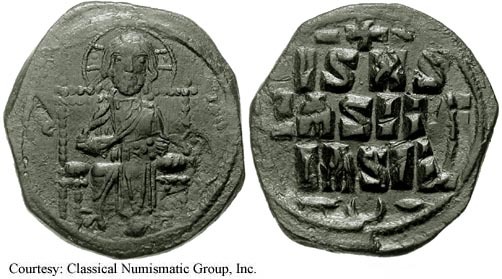 SB 1825 AE Follis Obv: CMMANOVHA - Facing bust of Jesus Christ, holding nimbus cross and gospel. Rev: IC XC/NI KA - Legend in the quadrants of a jeweled cross. c.1034-1041 (Nicomedia). 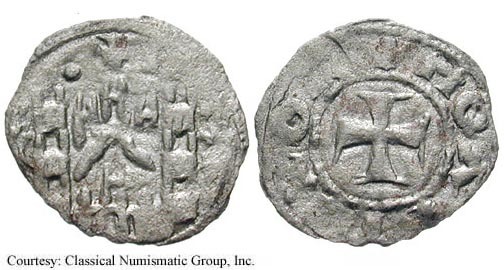 SB 1836 AE Follis (Class D) Obv: IC XC across field, Christ seated facing on throne, holding Gospels. SB 1910 AE Follis (Class J) Obv: Christ bust facing, raising hand. Rev: Cross on crescent; pellets around. c.1081-1118 (Constantinopolis). 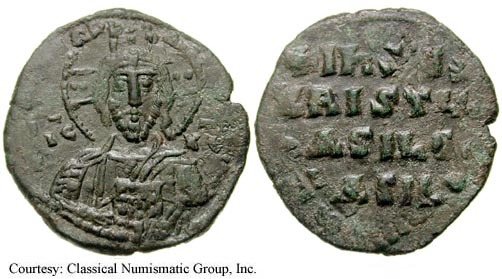 SB 1903, DOC III M.1 AE Follis (Class M) Obv: Christ enthroned. Rev: Jewelled cross. c.1080 (Constantinople). 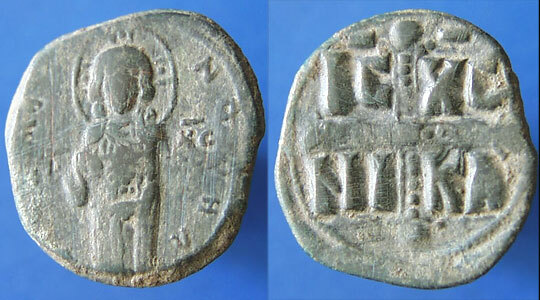 SB 2592 AE Follis Obv: Nimbate figure of Christ on footstool, clasping the hand of John, who holds model of city; stars scattered around fields. Rev: St. Demetrius standing facing, holding scepter and shield; star by head. c.1354-1369 (Thessalonica). $150 4/1/01.